Book series are great for getting, and keeping kids reading. If you know of a Minecraft fan (and who doesn’t!?) this is the list for you. Each of the selections here is a Minecraft Book Series for boys – you know they are going to love these. As I mentioned above these are to be considered fun books. Some of them are self-published or put out by a company that had multiple authors working on the series. There are sometimes typos and grammatical errors in the books but that usually makes for good conversation about quality and how people perceive a book when it includes errors. They are going on our book series for boys list because of content and because they certainly get kids reading. Diary of a Minecraft Zombie is an amusing series modeled after Diary of a Whimpy Kid. Follow along with 12-year-old Zombie and his friends as they navigate Minecraft and get themselves caught up in some crazy adventures. At the time this book list was created there were seven books in the series. Here is a another selection along the lines of Diary of a Whimpy Kid, Minecraft Diary: Wimpy Steve There are seven books in this series as well as some companion books and joke books. Steve is trapped in a Minecraft game and you get to read all about his adventures while he is there. Invasion of the Overworld is the first in the Gameknight999 series and also has a boy teleported into the Minecraft game. This one is a bit more intense that the Whimpy Steve series and has a survival theme. The series actually made it to the New York Times bestseller list. It has a lot of good reviews on Amazon and was a winner in our household. The second series by the author above is The Mystery of Herobrine with the first book titled Trouble in Zombie-town: Gameknight999 needs to enter Minecraft again to save his little sister. Characters from the 1st series make an appearance as do new characters and they come together to battle the zombie king. Currently three books in the series. The Quest for the Diamond Sword: An Unofficial Gamers Adventure This series starts out with Steve, quite happy with his Minecraft life, suddenly finds that zombies have attacked the village and turned the blacksmith into a zombie. Steve sets out to make sure he can still get swords and goes on a quest to find diamonds. He meets other treasure hunters along the way. There are three books in this series. Quest for Justice is part of the Elementia Chronicles Minecraft book series. It was written by a 16-year-old boy and features three friends who are playing on a server and find they have to defend themselves against experienced players and nmore. There are three books in this series to date. 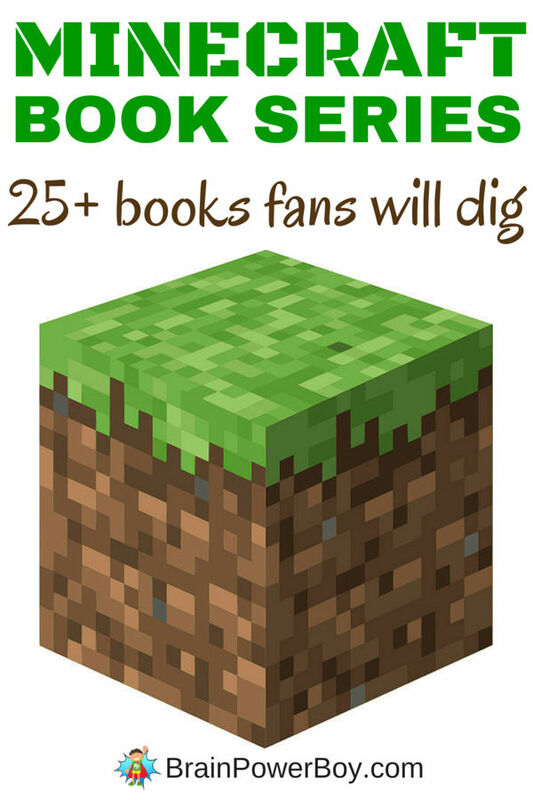 There you have it – over 25 books on Minecraft book series for boys to keep your Minecraft fan happy. Here is some more Minecraft goodness for you as well. The Very Best Minecraft Books which has the best non-fiction guides around. Minecraft Perler Bead Pattern: Creeper, Steve and Skeleton for some perler bead fun. Every one of these books is on my son’s wish list. He is really eager to read Diary of Minecraft Zombie. I didn’t know about some of the other ones you mentioned. I’m glad you shared them. Thank you for joining the #MotivationMondayParty. I hope to see you next Sunday at 8:30PM when the doors are open. So nice of you to visit 🙂 I’m glad to hear the list was helpful. I will be sure to stop by. My boys love the gameknight series and I must say I have learned far more about Minecraft by reading it with them! Hi Mother of 3, Nice to hear they enjoyed that series. It is a good one. I know what you mean about learning about Minecraft through the books – that worked for me too! My son will absolutely love these! He adores Minecraft. I’m so glad I found you through What To Read Wednesdays. We’d also love for you to link up this post at Literacy Musing Mondays #LMMLinkup.